The weekend immediately after the ACAL conference is the AFL Semi-finals*. 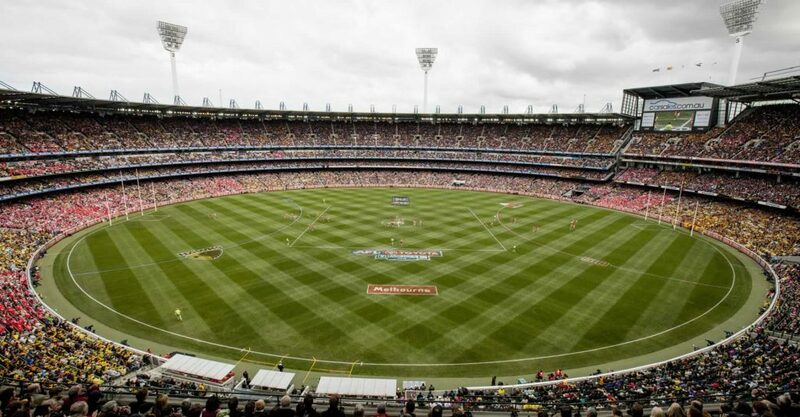 These matches can be played anywhere in the world provided it’s Melbourne. If non-Victorian teams have managed to do better than ‘OK’ they may be allowed to have a final played in their state but Victorian teams are entitled to win. *There are preliminary finals, elimination finals, qualifying final and the Grand Final. If more adjectives can be located, more finals may be added (but they’ll be played in Melbourne). having already begun a lifetime’s barracking. Pages of newspaper, and bytes of cyber are given over to pundits (i.e. retired players – sometimes better known now than when they played or because of their current hubris or rudeness) pontificate on percentages, points possession, priors and pockets. You can also see rotations, runners and rushed behinds. ‘Shepherds’, ‘smothers’, ‘specky’ (if you’re lucky), a ‘soccer’ and may be a ‘stacks on the mill’ might be on display. Once upon a time you would have heard ‘chewy on ya boot’ or ‘white maggot’ but times change. You won’t see Cazaly, Bobbie, Hassa, Barass, Dermi, Libba, Jezza or Richo but people will still talk about them (well, most of them) and people with grey hair will know who they where and what they did! Also Google ‘Shinboners’, ‘the Bloods’, ‘Jack Dyer’,’The Fuschias’ ‘Colliwobbles’. Six pages of coffee terms or why I always go for a flat white (it’s simpler). Combine coffee and footy and make a major environmental difference.